PHUKET: Phuket’s road-accident tally for the New Year holidays has reached six** dead and 47 injured following two more lives lost on New Year’s Day yesterday. The 24-hour period for Jan 1, day 6 of the Seven Days of Danger road-safety campaign for New Year 2019 – left two persons dead and 16 injured in 18 accidents, the Department of Disaster Prevention and Mitigation (DDPM-Phuket) reported this morning (Jan 2). The first death on the roads yesterday was that of Ekkapong Hiran, 27, who died after his motorbike crossed into the oncoming lane on a curve in Kata and collided with a motorbike being driven by Ruslan Chinokaev, 44, whose nationality was not noted in the DDPM report. Mr Ekkapong was rushed to Dibuk Hospital and then transferred to Bangkok Hospital Phuket in Phuket Town, but later pronounced dead from his injuries. Mr Ruslan suffered serious head injuries in the collision. He was taken to Patong Hospital and then transferred to Vachira Phuket Hospital in Phuket Town, the DDPM noted. The second death on Phuket’s roads yesterday was that of 54-year-old Chantra Thonhamkeaw who died after she lost control of her motorbike in front of Orchidacea on Kata Rd at 6:30pm and suffered fatal head injuries. She was not wearing a helmet at the time. 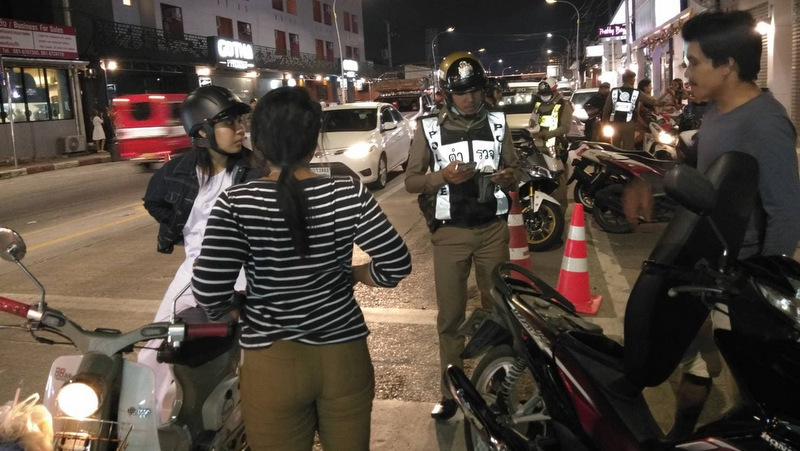 The two deaths yesterday bring the number of people killed on Phuket’s roads since the Seven Days of Danger road-safety campaign for New Year 2019, which began last Thursday, to six. Other accidents yesterday noted by the DDPM included that of 37-year-old Thai pregnant woman Apiew Tapiew, whose motorbike collided with another motorbike in front of Kamala cemetery on Route 4030 at 1:35am. The accident was deemed the result of reckless driving by Ms Apiew. She was not wearing a helmet at the time and suffered scratches to many parts of her body. She was taken to Patong Hospital. The condition of her foetus was not reported. Also noted in the DDPM report was an accident involving Valadislav Blanar, who the DDPM noted was from the “Czech and Slovak Federative Republic” (now dissolved into the two countries, the Czech Republic and Slovakia). Mr Blanar fell from his motorbike in Talad Yai, Phuket Town, at 8am, and was taken to Bangkok Hospital after suffering injuries to his left knee and scratches on his his face and left arm. He was not wearing a helmet at the time. The DDPM report also noted two foreigners injured in accidents while drunk driving yesterday. Tim Joza, 50, from Canada, was found to be drunk when he fell from his motorbike near the Diamond Resort in Cherng Talay at 3am. The DDPM report noted that Mr Joza could not remember how the accident occurred. He was not wearing a helmet at the time, and escaped with only scratches to his body. Lana Svetlana, 45, of Russia, was also found to be drunk driving after she drove her motorbike into a power pole near the COMO Point Yamu in Pa Khlok at 3:30pm. Both Mr Joza and Ms Svetlana were taken to Thalang Hospital, then transferred to Vachira Phuket Hospital in Phuket Town. • 20 fined for using mobile phones whilst driving. • 11 arrested for drunk driving during the period. Of the 6,811 people reported as fined for moving violations so far during the first six days of the campaign, 1,879 were caught driving without a licence, 2,892 were caught not wearing helmets while riding on a motorbike, and 518 were caught not wearing seatbelts.